What is a tour in semi-autonomy? What level should i have? What race to choose? Elite Ultra or Raid Ultra? What Is the Ultra Raid de la Meije difference with other MB tour? Night departure, is it dangerous? How are the climbs? Many bike carriage? What kinds of course are we going to meet? How time barriers are calculated? How many pit stops have you planned? What equipment is required for competitors? Where to find GPS record? Is Ultra Raid de la Meije feasible in tandem? Where is the departure and the arrival? The tour of the Cerces, the shuttles? How to get to the Ultra Raid de la Meije? When will start the registration ? Where to pick-up the race plates? Does the organization takes care of the accommodation? Are all the tests timed? What are the categories for the rankings? Is the gondola lift in La Grave open? Is there a massage service? Osteopath? Medical certificate or membership card ? The Elite Ultra race is reserved for very skilled biker, with regular race practice on important height difference, used to manage extraordinary effort. The race Raid Ultra, over two days, can be accessible to all highly trained cyclists. Two events called "Ultra" where the required technical level is important, all the raids taking place on single trail. To allow as many rider as possible to discover an extraordinary gaming field, some bike treks are open to all. Demanding treks, not to be taken lightly, but much more accessible than the Elite Ultra. This is a technical race and you need to master your bike. You also need to be able to handle a long-lasting effort at high altitude. What race to choose? Elite Ultra or Raid Ultra ? It's up to you to make that decision but do not overestimate you: there is much height difference, distance, altitude, technical trails and think about that even Raid Ultra formula in 2 days represents the cumulative of two large mountain biking journey. Elite Ultra: ATTENTION in 2019 you leave for 117 km and 5300 m of D + rankings on distances 105km and 72km are deleted for registered in Elite Ultra. You can register for the 72km only but the choice of 117 or 72km must be done at the time of registration. You hesitate in your choice? The formula Elite Ultra + is for you. The main race of the URLM, remains a challenge out of the ordinary 117km 5300m D +. You will be finisher or not classified, without possibility to leave the next day, except by take in an inscription on the spot but without possibility of classification. The first objective is to finish the Elite Ultra but it is possible to branch off in the course and be classified on 72 km by being able to leave the next day on the 52 km to be classified on the Raid Ultra, which corresponds in fact to the entire course of the Elite Ultra but traveled in two days. This registration will also allow you in all cases to ride on Sunday taking advantage of all the services of the URLM. Its cumulative height difference, its distance, type of trails but mostly the average elevation of its course, make the Ultra Raid de la Meije a real mountain bike raid in "high" mountain. This is certainly the only raid in Europe where you will have very little opportunity to go at high speed on high rolling trails. Note: throughout the journey, you will have less than 3% of asphalt. For your safety, you must wear a bright yellow vest (approved) and be equipped with a regular lighting (front and rear). The dangers of riding at night is minimized because only the climbing of the Galibier will be done at night (no dangerous descent will be done at night). How are the climbs? Much bike carriage? This will depend on your technical skills and your fatigue. There is of course pushing and carrying, but very little for this type of course if you are a trained biker. You will mostly meet long climbs (three of 1000m D+ on fire roads and mostly between 10 and 15% of slope). What kinds of courses are we going to meet? Fire roads and trails like hiking path, ground and rocks, fast lanes, trails or tricky single trails, real mountain biking. A good technical level is essential. Equipment in perfect condition is critical, you must have new and pre-tested brake pads. The time barriers Elite Ultra are calculated for you to go back to La Grave no later than 7 PM, corresponding to 13h maximum of riding. For the record the best time achieved by Yoann Sert are 8:35 (average speed = 13 km / h). WARNING: from the time barriers, you are considered outside organization but you will have to go back on your own and independently to La Grave. The organization does not support repatriation. How many pit stops you have planned? We have scheduled enough refreshments points, but you are on a high mountain raid so you must consider yourself in semi self-sufficiency and you must manage your hydration and your diet. See the race rules for retail but do not forget that you are in high mountains, so you must be able to protect you from both the hot and the cold weather, but also from rain or even snow. You are considered in semi self-sufficiency; do not forget your food reserves and drink. warm clothes (a long-sleeves shirt, a breathable waterproof jacket, leggings or long tights, warm gloves). Night departure (6h): front and rear lights and safety reflective vest are mandatory for all competitors. Equipment recommended: 1 GPS allowing to download the trace of the path (be careful to the autonomy depending on the type of race selected). Friday, September 13, 2019 at 19:00 precise in the village of La Grave. Randonné : Les Cerces 57km / Departure 09h00 from the Col du Galibier (Parking exit tunnel side Valloire), Saturday, September 14, 2019. Randonné : Les Cerces 47km / Departure 09:30 Plan Lachat, Saturday, September 14, 2019. Sunday, September 15, 2019 at 7:45 am precise on the starting line at La Grave. Raid Ultra 2° Stage: Emparis Besse 52km / Departure La Grave 08h00. Randonné : Emparis Besse 52km / Departure La Grave 08h00. Randonné : Emparis 35km / Departure La Grave 08h00. Randonné : Emparis 45 and 30 km departure from Chazelet 8:30. The traces visible on the website are not definitively validated for this edition, then are they not yet downloadable. A link to the final GPS traces will be sent to all registered competitors about eight days before the event. You are a few to ask this question. It is a raid in High Mountain, so is it not the most suitable spot to use a tandem. However, if you ask yourself this question, it is that you're feeling you are physically and technically capable to do it. The stage Emparis-Besse and the Sunday rides can be done without big issue in tandem. Some hairpin bend on the descent toward Besse will however be difficult to negotiate. Only the final downhill Le Chazelet-Les Fréaux is really a problem on 60% of it,representing +/- 180m of D- , that will need to be walked. For the stage Galibier-Cerces, longer and very technical, it will need a very high level to ride it in tandem, only a rider couple well above average will achieve it in tandem. In any case, we do not recommend you to start on this path without making a solo recognition in order to take the decision knowingly. E-Bike - e-MTB. Electric Mountain bike. E-Bike are allowed on all "Randonnées". Routes identical to mountain bikes except the last kilometer of the Galbier. However, they are strictly prohibited on the Elite Ultra, Elite + and Raid Ultra events. Elite Ultra, Raid Ultra and the 72 km Tour: departure from Villar d’Arène, arrival in La Grave? The 57 km Tour: departure from the Galibier: the parking at the tunnel exit on the Valloire side, arrival in La Grave. The 47 km Tour: departure from Plan Lachat, right where the competitors have to pass under the road (car park slightly further down on the Valloire side), arrival in La Grave. Raid Ultra and the 52 km – 35 km Tours: departure and arrival La Grave. 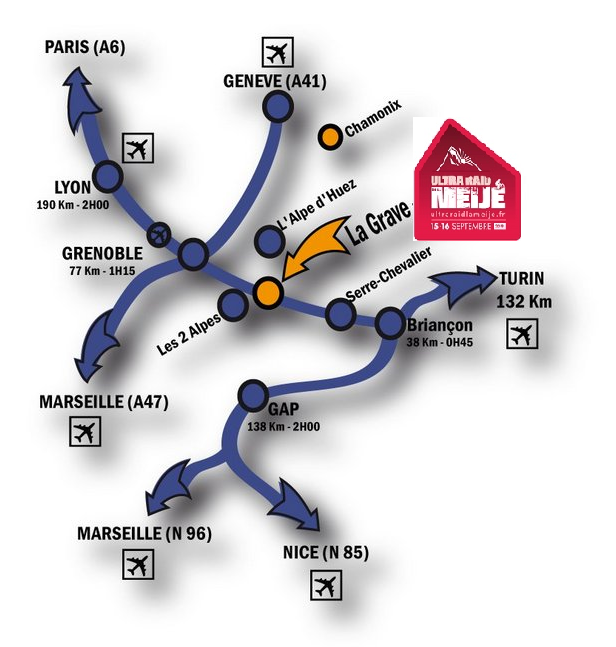 La Grave is located 80 km from Grenoble and 40 km from Briançon (these are also the closest train stations). Villar d’Arène (1664m) is 3, 5 km from La Grave (1491 km). IMPORTANT: if you wish to go between Villar d’Arène and La Grave by bike you will pass two dangerous tunnels. Lights and safety vest mandatory. On Saturday free shuttle buses will be at your disposal to take you back to Villar d’Arène between 4 and 7.30 pm and to Chazelet between 3 and 5 pm. The shuttles don’t take bikes. A free supervised bike parking will be at your disposal at the finishing line in La Grave. Tour of the Cerces, the shuttle buses? Saturday morning: Villar d’Arène / Galibier. Meet in Villar d’Arène between 7 and 7.30 am to load the bikes, obligatory departure at 8 am (18 € with bike). Saturday evening: La Grave/ Galibier. 1st shuttle at 6 pm, 2nd shuttle at 7 pm (10€, no bikes). ATTENTION: Mandatory pre-registration, very limited places. There is no organized shuttle for the departure of Plan Lachat you can use the shuttle Galibier and join the departure out of race by the road (8km downhill). How to get to the Ultra Raid de la Meije ? La Grave is located 80 km from Grenoble and 40 km from Briançon. Think about the environment, if you carpool you will release less CO2. By plane: departure and arrival: airports of Lyon, Geneva or Turin. From 2 February at 2pm. Registration only online here. You can pay by credit card. Only complete registration will be validated . A confirmation email is sent automatically. If you do not receive it: Check the email address given when registering or check your spam. IMPORTANT: we will close registrations on August 30th at midnight, or before if the limit of participants has been reached. Where do I pick up my race number plate? For the Elite Ultra, Raid Ultra and touring "Randonnées" options: at the Salle des Fêtes de La Grave on Friday September 13th 2019 between 3 and 7 pm. For the Sunday Tours "Randonnées": it is also possible to pick up your number plate at the Salle des Fêtes de La Grave from 6.30 am to 7.15 am on Sunday September 15th. Each competitor must have his UCI federation membership card or the original of the medical certificate, an ID with a photo and his race backpack with all the mandatory equipment. Deposit: you will need 20 € in cash to give the organizers in exchange for the control chip that is mandatory for all the races, even the touring options. The deposit will be given back to you when you hand in the control chip. For the touring options Randonnées : The original of the parental permission for minors. It is not possible to exchange your number plate. No number plates for the Elite Ultra, the Raid Ultra, the 2 day Tours or for the customisable 72 km tour on Saturday will be given out after Friday September 13th at 7 pm. The organization does not take care of your accommodation. All available accommodation partner are listed here or on the website La Grave - La Meije. There will be a men’s ranking and a women’s ranking in each category for the competitors that have completed the race in its entirety. You have signed up for the Elite + formula: if you complete the entire 117 km route you will integrate the Elite ranking. If you turn off to be ranked on the 72 km round, you will have the possibility to be ranked on the Raid Ultra. You can continue the next day on the second stage of the Raid Ultra to be part of the overall ranking on this race. With a penalty of 3mn (corresponding to the starting position of Saturday).Indeed, you can start the next day on the second stage of the Raid Ultra and thus integrate the overall classification of the event. Finishers will also have the opportunity to ride Sunday on the course of their choice while enjoying the benefits of the URLM. An individual scratch ranking will be established for each day as well as an overall scratch ranking based on each competitor’s added finishing times. Will the La Grave gondola lift (le Téléphériques des Glaciers de La Meije) be open ? Yes, this year the lift will be open the whole weekend. Both you and those who accompany you will be happy to see the glacier up close, touch the snow, hear the wind blowing and breathe the silence…SPECTACULAR PANORAMA AT 3200 m: close by you will be able to contemplate the glacier and the crevasses as well as La Meije (3982 m), far away you will see the Mont Blanc. Three orientation tables help you identify some of the most beautiful peaks of the Alps. Buy your ticket at the lift with a special Ultra Raid de la Meije discount. For those who wish to try a downhill descent from 2416 m to 1450m (the domain) it is possible on Friday or on Sunday, for those who race only on Saturday. Sign up at the time of your registration (limited in numbers): 10 € (no on-site registration). Leaving equipment on the route. Raid Elite competitors only will have the possibility to leave a bag with extra equipment (lights, safety vest etc. excluding mandatory equipment) at the food stall in Ventelon BUT you have to bring your own bag with your race number written on it with a permanent marker. You must pick up your bag at the arrival. As the bag contents are not checked by the organizational crew, no complaints will be admissible. We advise you not to leave valuable objects. Medical certificate or membership card? All the participants in these races have to prove their physical fitness either by a medical certificate from 2018 stating their aptitude to competition mountain bike racing or by a copy of their UCI membership card. The medical certificate template can be downloaded on our website. The sports federation membership card must be valid on the date of the race and must have a clear mention of the medical authorization for “competition cycling”.